The Capitals' White House visit is coming unseasonably late, and it appears that goalie Braden Holtby won't be in attendance. The 2016 Vezina Trophy winner said before Friday's game against the Wild that he had to "respectfully decline" the offer to visit in order to "stay true" to his values. Holtby joins Stanley Cup teammates Devante Smith-Pelley and Brett Connolly in sitting the visit out. "For me, it's just a personal thing. I believe in what I believe in, and in order to stick to those values, I think I have to do what I feel is right, but that doesn't make a difference on everyone else's decision. We stick by every single teammate we have and their decision," he said on Friday, per The Washington Post. "My family and myself, we believe in a world where humans are treated with respect regardless of your stature, what you're born into. You're asked to choose what side you're on, and I think it's pretty clear what side I'm on." Holtby added that the toughest part of the decision will be not attending with his teammates. "In the end, I never really came up with a situation where I'd feel comfortable going," he said, per The Post. "But the toughest part is I've always tried to live my life and my career that the team sticks together." Back in June, Holtby appeared to be on the fence about attending and his teammates seemed to be a big factor. "I don't know," he had said after the Capitals won the Cup, via The Post. "We're gonna try and make that a group decision. Weigh the positives and negatives of everything. In any situation like that, you want to make sure you're doing what's right for what you believe in and that should take thought and weigh a group decision. We'll discuss that later." Holtby added that the fact that everyone pays attention to who does and doesn't attend these visits has put pressure on athletes to make a choice. The Eagles, Warriors and Minnesota Lynx haven't accepted the invitation in the past. "Once the first team doesn't go it puts the onus on every other player in professional sports to be forced into making a decision, if you're political or not," he told The Post on Friday. "That's why I think our team, we're trying to take the most professional way we can with the every player has a right to choose and stand by each and every one of us regardless of what you decide." 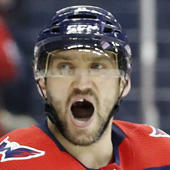 The Capitals are hoping to make another run this year, though they face a tall task in the Eastern Conference. Now that Holtby has made his choice, some dominoes may fall -- but Holtby clearly doesn't have any real concerns about this messing with the Capitals' chemistry.